How computers work: How touch-sensitive devices work? rectangular pad stimulates identical run the cursor on the monitor. In most of these measuring senses moving fingers changes the distribution of electric voltage in switches of pad causing large differences in electrical signals. With the use of pads that respond to touch,moving cursor can reach the speed of up to 100 cm per second. 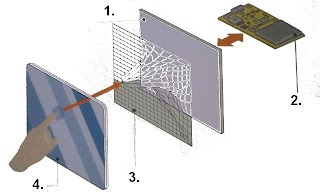 The system of touch-sensitive monitors - Electricity, released through the coating on the base layer of glass, produces a static electric field. Touching the monitors interfere with the field, and these changes the processor graphicaly displays. 2.Image Processor - The processor constantly scans an image of the electrostatic field. when changes occur in the image, processor makes calculation of coordinates. 3.The appearance of the electric field - a layer of conducting electricity with register changes in electrical voltage caused by touch. 4.The front layer of glass - the glass is electrically low voltage field that is changeable at the touch of a finger.